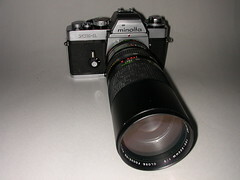 The Minolta XE is an electronic 35mm SLR camera introduced in 1974, just one year after the professional Minolta SLR X-1. It is called XE-7 in North America, and XE-1 in Europe. In many ways, this is a refined version of the X-1, but at the same time, the calibre is not quite in the professional league. It has a fixed finder and a slightly reduced shutter speed range. Despite quite similar body castings, the XE feels lighter and easier to handle, but with a solid feel. Gone are all the unusual controls. Instead, a few improvements are incorporated. Of notice is the rear on/off switch, and next to it, the frame counter with an integral film advance indicator, confirming proper film transport. A multiple exposure lever is added, coaxial with the wind on lever. For multiple exposures, it must be operated each time. 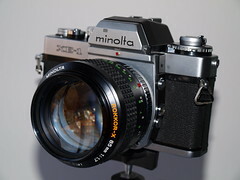 The traditional hot-shoe is at the top of the finder, while the finder shutter is a continuation of the previous model. 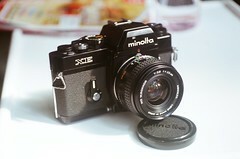 The Minolta Camera Co. entered in 1972 an agreement with Ernst Leitz GmbH, to share patents, know-how and product development, possibly Kazuo Tashima's crown achievement late in his life. He travelled Europe before founding in 1928 what later became the Minolta Camera Co., and the German camera industry had made a profound impression on him back then. The first camera to emerge from this joint venture was the Leica CL in 1973. Next came this camera, also assisted by the Copal Company for the development of the vertical running metal blade shutter. The German Leica R3 version was introduced by Leitz in 1976, and produced in Portugal, after a short run at Wetzlar. The exposure system is based on the well-proven CLC circuit, originally introduced on the SR-T 101, and refined by the X-1. The electronically controlled shutter has manually selectable speeds from 4 sec. to 1/1000 sec., and a backup mechanical 1/90 sec. and B. The shutter-speed dial locks in the A position, easily released by a tiny button reached when gripping the dial. The film speed is set on a dial surrounding the rewind knob. A small button just next to the black finder housing releases the ASA-dial. The value is set against an index dot to the right. To the left on the same dial is an exposure compensation scale of ±2 EV, which may easily be set depressing an almost invisible button on the dial edge. The viewfinder is quite bright and uncluttered with a centre split-image range finder. The layout is similar to the X-1, but the shutter speed scale to the right is brought closer to the image area and is much easier to read. The exposure-meter hand moves across the available speeds, brightly backlit by the SLR view extending beyond the image area. The lens aperture ring setting is visible just above the frame if sufficiently lit. Next to it is the actual shutter speed dial setting visible. Even more than twenty years after its introduction, this camera gives an impression of perfection, possibly only missing more automatic functions. The camera operates on a 3V silver battery or two 1.5V SR44 batteries. A battery check lever with a red LED is on the left-hand side of the body. On the left-hand front is the lens release button, high at the left-hand side of the mirror housing. A PC sync. contact and an X/PF selector switch are also on the left-hand side. A lens diaphragm stop-down button is on right-hand side at the bottom of the mirror housing. Normal position is pushed in, for stop down it is pushed and let out. There is no mirror up facility. A traditional self-timer with trigger button is to the right of the mirror housing. On the base are the rewind release button, the tripod socket and the battery compartment. The home market XE, and the XE-1 were available in either chrome or black finish, while the XE-7 came in black only. In 1976 the simplified XE-5 was made available, in Japan called the XEb.